This limited edition image is introducing a new edition -- the Contemporary Edition -- which is published as a wrapped canvas so that it can be hung with or without a frame to please both the modern and traditional aesthetics. 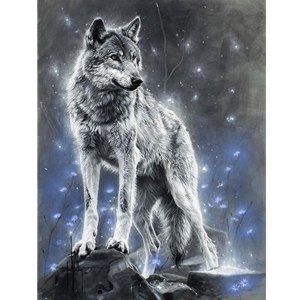 Generally, a mated pair, the alphas, will lead a wolf pack, and most often, the rest of the pack is made up of family. It is typical for there to be only one female within a pack because they leave to establish their own packs as they mature. This beauty has raised several litters of pups and nobly leads her pack alongside her co-alpha mate. She stops to survey her progeny as she gracefully waits for the rest of her pack to catch up on their nightly run.